Een aflevering van SPOORLOOS ? Het onderstaande speelde zich af in het weekeinde van 28 t/m 30 maart 2009. Toen ik zaterdagmorgen 28 maart 2009 m'n PC aanzette, verscheen de volgende email vanuit de westkust van Amerika. Om privacy redenen zijn de namen gefingeerd en delen van de mailteksten weggelaten. My name is Helen Strong and I am searching for biological relatives. I would be so grateful for your help. I have searched your amazing website but am lost! I would be very grateful for any information you might have or this Jaarsma family or any suggestions you might have to continue my search. She has two brothers: Durk Jaarsma, Born 1918 Died: ? Oh my goodness! This is incredible! I cannot thank you enough for this information. Your family tree information is so extensive and beautifully organized. I have not searched for family out of respect for my adoptive parents. My father died several years ago and my mother is now 90 and sufferers from dementia and blindness. My husband and I were vacationing in Utah last month and, by chance, toured the Mormon Temple and their Family Search Center. I decided to see if there was any information about the Jaarsma family and with the help of a Mormon sister, Gerta Bols, who was from the Netherlands (also by chance that she would be the one to help me!) we found the information I shared with you earlier. The story I have always heard about Mother is that she was an artist. How she came to be in Germany is uncertain but we do know she was unmarried, Catholic and ashamed to return to the Netherlands with a baby. She placed me in a displaced persons camp until she decided what she would do. She apparently heard that the Chaplin and his wife were hoping to adopt a baby and contacted them. I do not know what happened to her after the adoption but it was rumored that she married an American and moved to the US. I have all the adoption records along with a photo of Mother. I would love to learn what happened to Mother and if she had any other children. What would you suggest as a next step in this search? I have attached my birth certificate to verify my information and because I notice on some records Mother's name is sometimes spelled as Grietje but on the documents I have it is Grytje. Ondertussen ben ik gaan uitzoeken of er nog andere familieleden van Joanna te traceren zijn. Van haar moeders oudste broer Durk heb ik geen verdere gegevens kunnen vinden. De jongste broer van haar moeder is op jeugdige leeftijd overleden. Helens grootvader heeft ook nog een broer, Joseph. Van hem weet ik alleen dat hij in 1902 naar Amerika is geëmigreerd en daar de naam Jarsma gebruikt (dus geen Jaarsma). Het is buiten toch slecht weer en besluit daarom op internet te gaan zoeken. Daar vind ik meer gegevens van die broer. Onder andere zijn overlijden in Kalamazoo, Michigan, in het noorden van Amerika. Met Jarsma en Kalamazoo zoek ik met behulp van Google en vindt daar diverse Jarsma’s! Zelfs één met een eigen website Ik besluit deze man een mailtje te sturen met de vraag om meer Jarsma gegevens. Naast Joseph is er ook nog een zuster van Helens grootvader: Fokje. Van haar weet ik dat ze in 1911 getrouwd is met I. K. en een zoon of dochter hebben met de initialen A.I. Op internet raadpleeg ik het telefoonboek op die familienaam. Gelukkig zijn er maar ca. 20 personen met die naam, maar geen met de initialen A.I., maar wél met I.A.. Ik besluit een gokje te wagen en bel deze persoon. Wat blijkt: zijn grootmoeder is inderdaad Fokje Jaarsma! Hij weet me te vertellen dat zijn vader (initialen A.I.) hem ooit vertelt heeft dat oom Joseph met zijn vrouw een keer vanuit Amerika plotseling voor de deur stonden. Deze familierelatie is dus zeker. You are so wonderful! I cannot believe all the information you have found. I so surprised when I saw that there was family in Kalamazoo. I sometimes become a little emotional because I never thought I would have any connection to history. It is exciting. Next week I will go to the Social Security offices here to see if there are records for Mother and I will let you know what I find. The problem is that if she immigrated under a married name it will be difficult to trace. Thank you for all that you are doing. Wij vonden geen informatie betreffende Mother Jaarsma. Mogelijk is zij nog in leven. Haar broer Durk Jaarsma is overleden in 20xx. Hij was gehuwd en zijn vrouw is ook overleden. Van dit echtpaar zijn ons twee zoons bekend, namelijk Obe Jaarsma en Sietze Jaarsma. De laatste woont waarschijnlijk in Q. In de nationale telefoongids vonden wij zijn adres en telefoonnummer. Oh my goodness! I just cannot believe this. I am crying so hard. I will write more in a little while. Thank you - such small words for this enormous gift you have given me. Thank you so much for the news of my mother. It was quite a surprise. I never dared to dream that this might be true. I am very happy that she has lived to this age and that she has 3 children. This means that she has had some joy in her life! I would, of course, like to visit her but it is quite possible that she and her family might not feel the same. I want to be respectful of their wishes. Do you have suggestions on what to do next? Your web site is wonderful! I spent quite a bit of time this morning admiring at your photos, your garden and your art as well as learning about you and your volunteer work. You are such a splendid and accomplished man. Please thank Sietze for his kindness. I do not want to embarrass or make Mother sad. I would like to tell her that I knew times were difficult for her so many years ago and that I understand that she could not keep me with her. I would also tell her that I have thought of her all of my life with great love in my heart and thank her for giving me to wonderful parents who gave me a good life. You have spent so much time helping me, Tim. I am very grateful! Het is maandagavond 30 maart 2009. Dankzij internet en de hulp van allen die daarbij betrokken waren, is het gelukt om Helen te laten weten daar haar moeder nog leeft en dat zij ook in Amerika veel familieleden heeft. I was interested in seeing some of my family history, thank you. I found the name John is prevalent in my direct family and my in-laws. That was a cool happening. I have contacted my dad to fill in some of your blanks and I will fill in the blanks of our current family. Thank you for the additional family tree information. Every day I pray that Mother is not unhappy about this news and that her family is supportive and loving toward her. In the event that Mother does not wish any contact I will understand and I am prepared for news either way. I will honor her wishes completely. Isn't this an incredible story?! In de week daarna legt Sietze contact contact met Mother; eerste telefonisch en later met een in het Nederlands opgestelde brief. Zij is n.l. de enige van haar familie in Amerika die dat kan lezen. Naar aanleiding van deze brief belt Mother naar Sietze en legt hij uit wat er gaande is. Het blijkt dat alléén Mother op de hoogte is van het bestaan van Helen. Zij vraagt een week bedenktijd en zal daarna weer bellen. I also heard from Sietze today. He tells me that Mother would like to hear from me by letter. So today I wrote a letter and told her how I came to find her through you and gave her a little of my family history. It is a little step forward and I will be patient as she adjusts to this news. I will keep you up today as things progress. May 28, 2009: I went to the post office to pick up all our mail. On the top of the pile was a letter from Mother, It was much like mine in sharing family information. One encouraging thing is that she said she would tell me more about her life in "future letters" and that "it would be best for the time we just wrote to each other". I am very happy to know that she has such a wonderful family and that she would like to continue correspondence. Today, 14 July 2009, I received my third letter from Mother. She writes "Engraved upon my heart and mind is the image of you, the way your looked on the last day I saw you.........I only have to close my eyes and the image of you appears and the tears flow again.....I have buried much of what happened then so deeply in myself and did not allow myself to think about and I never let anyone into my feelings." In each letter she reveals a little more. It is a slow and emotional process for us both. She is so sweet and so frail that I think it is best to let her tell her story in her own time. At some point she will decide one way or the other but I am afraid if we force the issue she will retreat back and I will never learn the truth or have the opportunity to see her. April 29, 2010: It has been quite a while since I have written to you and now seems like a good time to catch up and let you know what is happening. It has taken the better part of one year to make things all come together with Mother and her family. There have been some bumps along the way but for the most part all is well. I have talked with her on the phone several times and it has been wonderful. Her oldest son and I have become very good friends and I, of course, enjoy that! I will travel coast to coast to Virginia to meet Mother and the family in June. We will see how it goes! 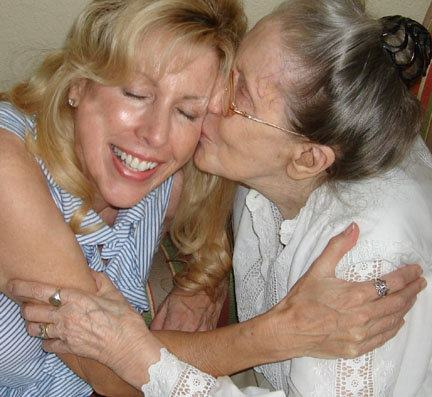 May 24, 2010: Mother and I will finally meet on June 20th or 21st (depending on how late my flight arrives) at her home. I have had daily, and affectionate correspondence with Mothers oldest son. Mother and I speak on the telephone about once a week and that is wonderful too. Her daughter, Margret and I have corresponded a couple of times. The youngest son has not contacted me but he does have my information. I think I need to build trust with the two youngest yet. That is understandable! It is quite amazing isn't it!